C-1 Technology's E4010 series SATA DOM supports SATA lll 6.0 Gb/s and are backward compatible with SATA tl 3.0 Gb/s speed. This E4010 SATA DOM SSD processor is architected to leverage today's densest MLC NAND Flash memory while E4010 Pro uses SLC NAND Flash memory. E4010 could be easily plugged into any standard 7pin SATA connector and replace HDD directly. This is the best solution for industrial equipments as a storage device. E4010 is designed to meet the stringent demands of server environments and enterprise applications. These new premium offerings are the pinnacle storage option excelling in performance, reliability, and power consumption. 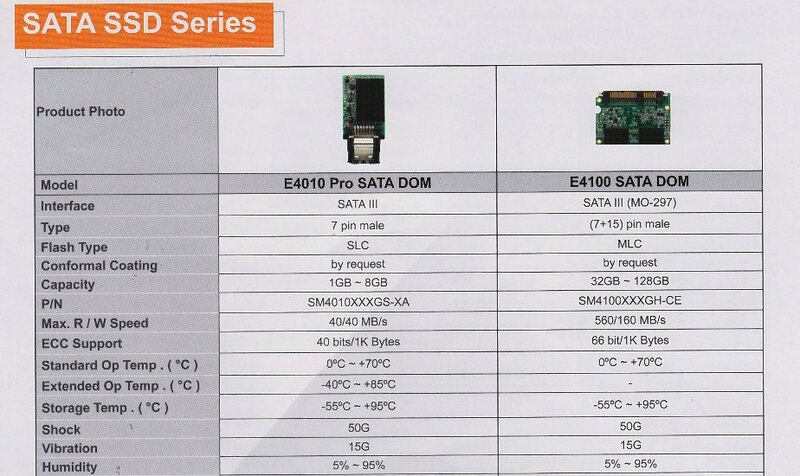 For E4010 SATA DOM product datasheet, please go to here. please click here. for detailed datasheet! please click here for detailed datasheet!